Back by popular demand, we proudly present our next limited edition single barrel release: Coffee Infused Bourbon Whiskey. This year’s release is made in collaboration with Cleveland’s own Black Barrel Coffee Co. The smooth 90 proof bourbon features strong notes of coffee, dark cocoa, and a slight fruitiness that will inevitably delight your taste-buds. This special release will be available to sample at the distillery at the Open House! 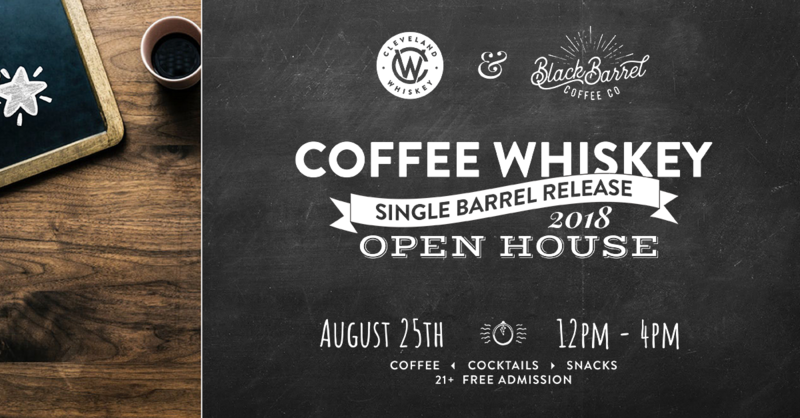 along with cocktails made with the whiskey and Black Barrel Coffee Co cold brew made with the same beans used for the collaboration. Keep checking back to our Facebook Event page, as we’ll be updating it as more information comes in, including some surprises that we can’t wait to announce. As always, this open house will be FREE and open to the public. Guests must be 21+ or accompanied by a parent or guardian. Parking will also be free in our lot, indicated by signs on the day of. Keep in mind, the Coffee Infused Bourbon Whiskey will be available ONLY at the distillery. You won’t be able to purchase it anywhere else. Bottle sales will begin when the doors open, first come first served. Unfortunately, we won’t be able to hold or ship bottles.